"Vaccines help keep a pregnant woman and her growing family healthy"
Find out if you need any shots before you get pregnant. Many shots last a lifetime. However adults may need new shots or “booster” shots. You may need shots to protect against: influenza (flu), tetanus, diphtheria and pertussis (Tdap), human papilloma virus (HPV), measles, mumps and rubella (MMR), chickenpox (Varicella), and hepatitis B. 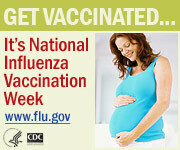 During your pregnancy, influenza (flu) can cause serious health problems for you and your baby. Influenza season is from November through May. Be safe and get the flu shot to protect both you and your baby from the influenza virus. The nasal mist flu vaccine is not licensed for use in pregnant women. Talk with your doctor about shots you may need to protect against diseases which are still common in other parts of the world. These shots, which may pose a serious risk to your baby, include: MMR, Varicella and HPV. Women should not get pregnant for at least one month after receiving the MMR or Varicella shot. HPV is a 3-dose series. If a woman is found to be pregnant after receiving the first shot, she should delay the next two shots until after the birth - the first shot does not need to be repeated. If you received a shot for MMR, varicella or HPV and did not know you were pregnant, talk with your doctor right away. After the birth of your baby, get any immunizations you may have missed. Some shots are given in the hospital before you leave. Newborns are too young to get immunized against the flu and pertussis (whooping cough). To protect your new baby, influenza and Tdap shots are needed for anyone who lives with or takes care of your baby. He or she can tell you which shots you need, based on your age and health history. He or she can also run simple tests to see if you need certain shots. For more information about immunizations, contact your health care provider. You may also contact the San Diego Immunization Branch at (866) 358-2966.